We have a cat. She adopted our home as a kitten while it was still our construction site, and lived through many hard years before becoming the spoiled cat of the house. Her name is Stray Cat. This causes no end of confusion at the vet. She does not like other cats. This is an interesting conundrum because other cats like our house. They visit our yard and hang our on our deck. Sometimes they do so enough to have us give them a name. In recent months a ginger cat has decided to hang out on our porch. We have named him Rudy. If you ask me, it’s for “Rutabaga” which are orange when cooked. If you ask my husband, it’s for “Rudolph the red-nosed cat”. Either way, Rudy visits and gets a small bowl of kibble. He is skittish and won’t let us near him, but enjoys the kibble. We’d like to capture him and get him to the vet for shots and a check-up, but it seems unlikely for now. I’d love to get a photo of how he stretches his neck when coming out from under the porch to see if there is kibble in the bowl, but that will take a bit of luck. 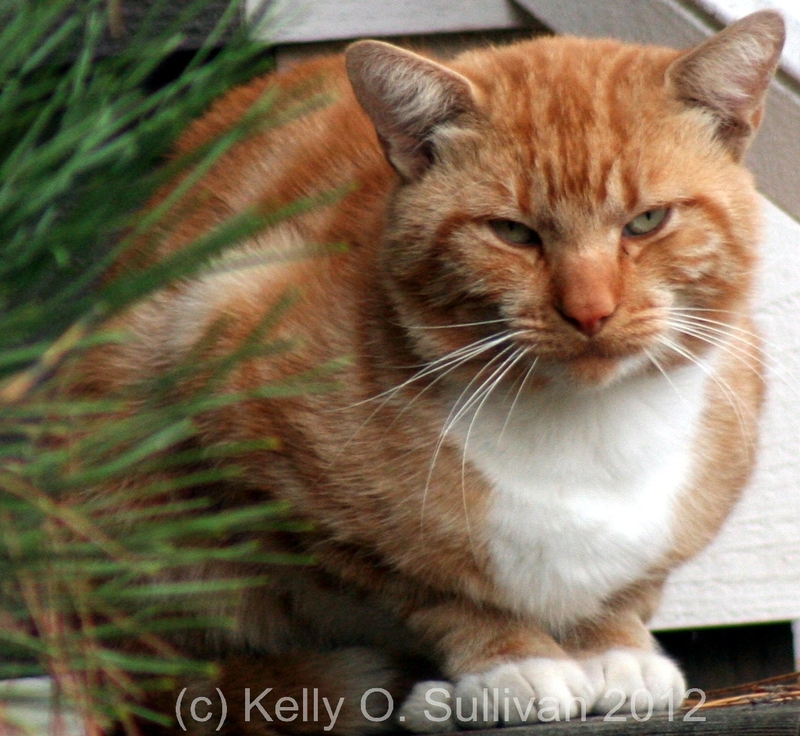 In the meantime, this is a photo of Rudy watching me wander around the yard taking pictures of flowers.